The intense public debate on how rapidly the Himalayan glaciers are retreating highlights the necessity for the constant monitoring of glaciers worldwide by satellites. Since glaciers are among the most reliable indicators of climate change and because they can have a major influence on water availability, knowledge of the recent changes and future behaviour is of great interest for climate scientists and governing bodies. A key to assess these changes or to model their future evolution is the existence of a detailed glacier inventory. Data from satellites allow scientists to measure glacier extent in detail, providing authoritative evidence of trends. They also allow local measurements to be expanded to a regional scale. Considering the valuable role satellites can play in determining the state of Earth’s glaciers, the Global Climate Observing System (GCOS) has called for the systematic monitoring of glaciers by satellites in support of the UN Framework Convention on Climate Change. In 2007, ESA started the GlobGlacier project as a major effort to develop and apply existing methodologies to monitor glaciers and contribute to a global glacier inventory using satellite observations. GlobGlacier, part of ESA’s ‘Data User Element’, is adding about 20 000 of the estimated 160 000 glaciers worldwide to this inventory to allow their histories to be adequately tracked. Kashmir, part of the Indian Himalayas, is one of the selected regions where little information is available on overall glacier extent or changes. GlobGlacier is creating inventory data for more than 1000 glaciers in this region. The inventory combines information on glacier outlines based on archived satellite data from the Landsat Thematic Mapper (TM) and the Enhanced Thematic Mapper Plus (ETM+) instruments with topographic information from the Shuttle Radar Topography Mission and the Global Digital Elevation Model (GDEM) from ASTER (Advanced Spaceborne Thermal Emission and Reflection Radiometer). When a time series of suitable images are available for a certain region, changes in glacier length and extent can be calculated. “Such data allow scientists to assess the overall pattern of changes in a larger region for a better determination of climatic change impacts,” said GlobGlacier Project Manager Frank Paul from the University of Zurich. The above animation, based on data acquired by Landsat’s TM on 15 November 1990 and by ETM+ on 1 August 2001, illustrates the changes in glacier extents that occurred during this time in the region northeast of the Gangotri Glacier, situated in Garwhal Himalaya. 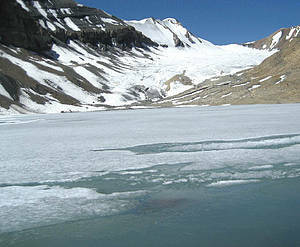 While most of the smaller and debris-free glaciers show considerable retreat in this period, the larger glaciers with completely covered tongues have not changed much. Several of the pro-glacial lakes have grown. Quite a few glaciers at lower altitudes are nearly free of snow in the August 2001 image, indicating a retreat that year. ESA’s ERS-1, ERS-2 and Envisat Advanced Synthetic Aperture Radar (ASAR) data are providing velocity measurements of selected glaciers. The image to the right shows the surface velocity field for the Baltoro Glacier in Pakistan based on Envisat ASAR data from 2003 to 2008. ESA’s new Climate Change Initiative, which will produce robust long-term records of essential climate variables, will build on the results of the GlobGlacier project by further improving the algorithms for glacier monitoring and continually updating the related glacier inventory information.